Shawn Nelson is one of three elected or formerly elected Republicans running to fill the 39th District U.S. Congressional Seat that will become competitive with the retirement of incumbent Ed Royce, Jr. In a recent email crowing about his endorsement by the California Republican Assembly, he reveals that he is running for Congress to, among other things, “protect you from the threat of illegal immigrants.” In a year when the biggest question Republican candidates face across the country is whether to run with or away from national disaster Donald Trump, Supervisor Nelson has wasted no time in giving us his answer. Unregulated immigration is without doubt an issue that needs to be addressed, but in a systemic, humanitarian way that seeks to correct the underlying causes of the desperate poverty that drives the phenomenon. Beginning a list of three reasons for a congressional run with “illegal immigration,” and preceding the term with the word “threat” is an unveiled, direct appeal to a voter base that responded to similar language used by Donald Trump, who may have lost California in 2016, but had significant support in parts of the 39th Congressional District. In the race against undistinguished one term Assemblywoman and Royce protegé Young Kim and retired State Senator “Aloha” Bob Huff, the Nelson campaign has left little doubt about how it will position its candidate in the coming months. 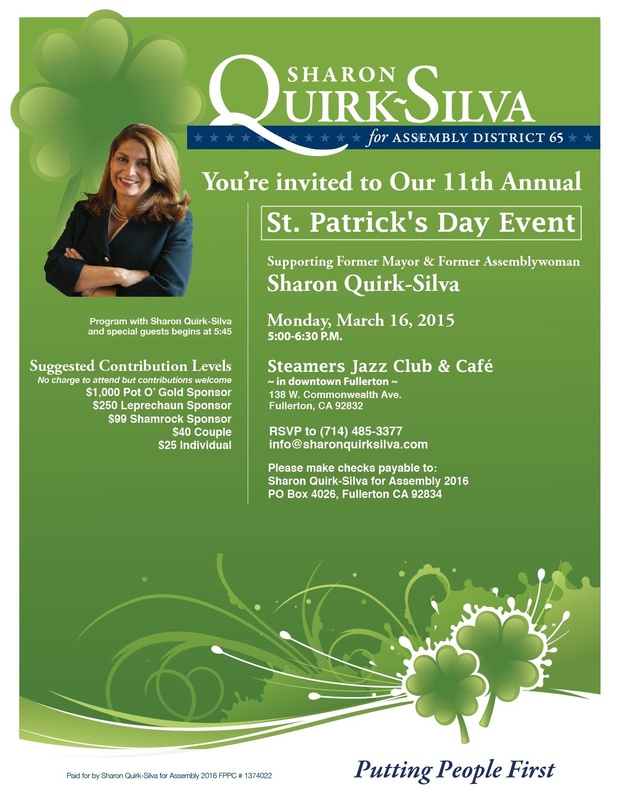 On Monday, March 16 Democrat Sharon Quirk-Silva will host a fundraiser for her bid to reclaim the 65th California Assembly seat from freshman incumbent Republican Young Kim, who triumphed over her in one of the most expensive Assembly elections in state history last year. In 2012 Sharon Quirk-Silva scored an upset victory over then-incumbent Chris Norby, helping the Democrats to secure a solid two-thirds majority in both legislative houses. While in office, she promoted the establishment of a federal cemetery for military veterans in Orange County. Her voting record can be found here at votesmart.org. It is generally favorable toward labor and immigration priorities, and shows support for limiting high capacity magazines for some guns–just the sort of issues to coax steam from the ears of conservatives. Her environmental record is mixed, showing two “Nay” votes against a statewide plastic bag ban. Lamentably, The Rag has no indication that she ever sought reform of POBR, the Peace Officers Bill of Rights, to require more transparency and accountability of law enforcement officers and agencies. Her re-election in 2014 was all but impossible given the low voter turnout by Democrats in that year’s mid-term contest. Many voters quickly tired of receiving dozens of mailers from each campaign every week, but at least it was a contested election, something nearly unheard of thanks to gerrymandered legislative districts that normally favor one party over the other. Barely three months into the job, Young Kim doesn’t have much of a record to run against, other than offering a bill that would prohibit adding toll lanes to OC freeways without direct approval of the electorate–something likely to be popular among voters. With Prop. 14 in place to eliminate third party candidates, it could be a very close election. Sharon Quirk-Silva is no doubt counting on higher voter turnout by her party in a presidential election year to put her over the top, but she may need a stronger message to motivate the electorate this time around.